The following post is what I wrote for the first 2-day essay in my developmental biology course. It covers the potential limitations of mathematical modeling in developmental biology – specfically, the reaction-diffusion systems of the computer scientist, Alan Turing. Perhaps the larger point I try to make is that ideas that are initially and blatantly disregarded as irrelevant seem to reappear later on as actually important! The post is a bit bulky but hopefully you find it of interest! The evolution and development of animal form has been the subject of study for many evolutionary and developmental biologists. The prime model for animal development has been the fruit fly Drosophila melanogaster. While biologists now know flies are developmentally unique, fundamental models have been constructed to explain fly development. Several models have been theorized but no mathematical model has been as arguably influential as Alan Turing’s reaction-diffusion equations. Alan Turing was not a biologist, but a mathematician and the founder of computer science. Well-known for cracking the Nazis’ Enigma Code during World War II, Turing sought to crack another kind of code – how animals could develop from chemical substrates. He believed development could be reduced to mathematical axioms and physical laws. The central idea behind the theory is that two homogeneously distributed substances within a certain space, one “locally activated” and the other capable of “long-range inhibition,” can produce novel shapes and gradients. 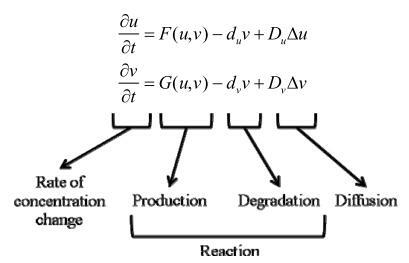 The results of these substance interactions are dependent on just four variables per morphogen – the rate of production, the rate of degradation, the rate of diffusion and the strength of their activating/inhibiting interactions. The equations are shown in Figure 1. It should be noted that these equations are not necessarily the ones derived by Turing. As his work was published nearly 60 years ago, his work has undergone several revisions and applied in different ways. What is special about such a model is that it can explain pattern formation without a preformed pattern. That is, the reaction-diffusion model can explain how those initial patterns form in the first place. While fly development begins with a maternal injection of bicoid into the oocyte, a reaction-diffusion system can theoretically give rise to a pattern without an initial asymmetry. Figure 2 shows how a reaction-diffusion system of two molecules, P and S, works. P stimulates the production of itself (autocatalysis) as well as the production of its inhibitor S – S inhibits P. Furthermore, P diffuses slower than S. The initial conditions (2B, Time 1) are a random distribution of both substances – no pre-pattern. Now what happens? Since P stimulates production of itself and diffuses slowly, P concentrates into a peak (2A, Time 1). Furthermore, since P is stimulating production of its inhibitor S which quickly diffuses, P concentrations fall as you move from the peak. This results in a single peak (2A, Time 2). However, as S can only travel so far, multiple peaks are capable of formation as shown in 2B, Time 3. The results are what are called “standing waves.” Local activation (P) and long-range inhibition (S) form regular patterns. (Note that the rate of degradation was not considered in this model.) Figure 3 shows possible results of the Turing model by changing the values of the different parameters. Figure 3: Turing patterns. Source: Kondo and Miura 2010. That is the mathematical model – but how does this apply to biology? Of course, we have to first examine if the model explains Drosophila melanogaster development. Early embryonic development in the fly does show standing wave patterns as produced by several classes of morphogens. Since the Turing model requires only two morphogens to establish a complicated pattern, evolution would surely favor such a simple design. This is emphatically not the case, however. Fly patterning is actually much more complicated than a Turing model would suggest as the segment patterns are established by a series of maternal, gap, pair-rule and segment polarity genes – much more than two morphogens. “…Many theoreticians sought to explain how periodic patterns could be organized across entire large structures. While the math and models are beautiful, none of this theory has been borne out by the discoveries of the last twenty years. The mathematicians never envisioned that modular genetic switches held the key to pattern formation, or that the periodic patterns we see are actually the composition of numerous individual elements” (123). In other words, mathematically elegant but biologically irrelevant. Several scientists disagree with such a blatant disregard of Turing’s model, however. They believe that while fly embryogenesis cannot be explained by reaction-diffusion systems, other patterns can be – such as hair follicle distribution in mice, stripe formation in zebrafish, and even left-right asymmetry in bilaterians. The first biological example of a potential reaction-diffusion model discovered was in hair follicle formation in mice. Sick et al. (2006) found that follicle development is controlled by a WNT/Dkk1 system – WNT induces follicles and Dkk1 inhibits WNT expression. Experimentally disrupting pattern formation matches up with the predicted Turing model. For example, overexpressing Dkk1 (the inhibitor) stops follicles from forming. Additionally, Sick et al. discovered other molecules involved in the WNT pathway that appear to just modulate WNT expression levels. This means that even with additional morphogens the model does not need to become any more complex. Unlike previous examples in the past, Sick et al. identified a genetic system before creating a reaction-diffusion model and experimentally verified its predictions. An interesting point made by Kondo et al. is that the WNT/Dkk system is present in other contexts, such as lung branching in vertebrates and head regeneration in Hydra. Perhaps WNT/Dkk is a reaction-diffusion system that can be transposed into other backgrounds to fulfill specific roles in organisms. Another potential example is stripe formation in zebrafish (shown in Figure 4). 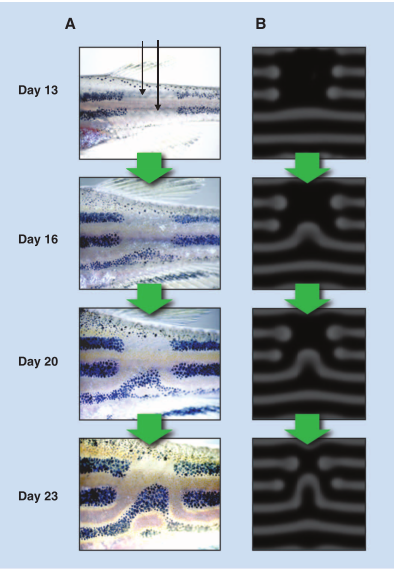 In the left column is a growing zebrafish with a section of two stripes destroyed by laser and the following photos show the subsequent stripe recovery. The blue/black cells act as activators and the faint yellow cells act as inhibitors. In the right column is the recovery as predicted by a Turing model. As can be seen, the model and the reality match up particularly well. However, as with flies, there is a difference between the mathematical model and the genetics. Kondo et al. (2010) report that a study of the genetics is under way. Perhaps zebrafish stripes will join follicle distribution as a biological reaction-diffusion model. Reaction-diffusion models provide a predictable mechanism for pattern formation. Such models have limited applicability, however, and scientists are still not even completely sure if the proposed models are truly reaction-diffusion systems. As biologists further understand how the underlying genetics of phenotypic patterns like zebrafish stripes work, we will be able to definitively decide whether reaction-diffusion models are biologically relevant. In the meantime, what this work shows is that disregard of ideas that are scientifically sound can be harmful. Yes, initial trials did not succeed but that does not mean the idea will not apply to anything. Scientists have found several systems that at least fulfill the “fundamental requirements for Turing pattern formation” – local activation and long-distance inhibition – and now the Turing model has to be tested. If the model works, great! If not, move on and see if it works in another. Figure 4: The matching of zebrafish stripe formation and a Turing model. Source: Kondo 2010. Not only that, but such models can help generate more scientific questions. As aforementioned, the WNT/Dkk system is found in follicle distributions, Hydra head regeneration, and lung branching in vertebrates. Even if these do not follow a reaction-diffusion model, why does WNT/Dkk appear in three (seemingly) totally different contexts. Is the function of WNT/Dkk systems homological in the three contexts or has it actually been repurposed in novel ways? Furthermore, if follicle distribution is not a reaction-diffusion system, why does it follow the model so closely? Is there an underlying reason waiting to be discovered or is it just happenstance as in fly development? Turing’s work has not been flatly accepted by sympathizers either. The specific equations from Figure 1 do not apply to every system. Instead, scientists have repurposed his derivations in a multitude of ways. For example, Turing models assume a static space. If the space in which the substances reside expands, the Turing model as is falls apart and no gradients are established. Madzvamuse et al. created a Turing-like model that does take an expanding space into account. They also created a model that incorporates an activator-activator system (as opposed to an activator-inhibitor system). So even if the Turing model is not totally correct, it can potentially be modified to fit other systems. It has much potential – all that is required is local activation and long-range inhibition. So mathematical models may not truly describe how reality functions or works, but it can describe the relationships between different variables. D’Arcy Thomson, for example, accurately described the allometric growth ratios in seashells and others have done the same for the large claw in the fiddler crab. Thomson’s work was not based in genetics, however, so it is of limited applicability, but there must be a reason these ratios exist – not necessarily adaptive reasons, but some kind of reason based in how biology functions. The jury still seems to be out on whether mathematical models, specifically Turing’s models, are useful, despite what Sean B Carroll claims. Even if the reaction-diffusion system does not apply to much of anything, it can still generate useful questions that biologists can further explore. There is danger in throwing out mathematically and scientifically grounded theories – just because they have not been shown to work yet does not mean they do not work at all. Alan Turing had many brilliant ideas and there is no need to disregard this one. Gilbert, Scott F. “Mathematical Modeling of Development.” Developmental Biology. 6th ed. Sunderland, MA: Sinauer Associates, 2000. http://www.ncbi.nlm.nih.gov/bookshelf/br.fcgi?book=dbio&part=A79. Remarkably readable, truly simplification of the complex. I suspect your first equation ought to have its degradation term proportional to u rather than v.
Very nice work here, thank you for the knowledge! Very cool summary, and accessible to an ignorant biochemist…..well done! Great summary with beautiful figures – thanks! Do Meinhardt and Gierer not deserve to be mentioned?